The video above was filmed when Maria was presenting at Creative Mornings. Here is a link to that organisation. 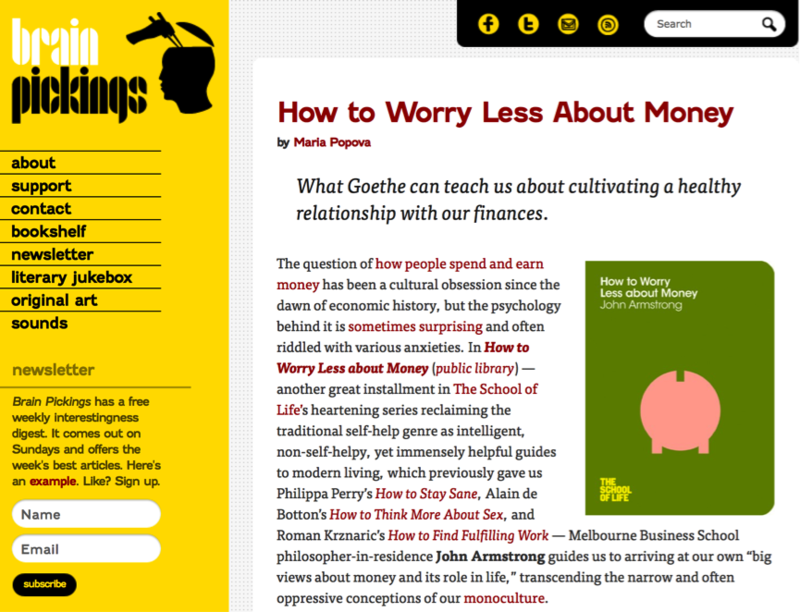 Below are excerpts from the Brain Pickings website. You can discover more via the following link. 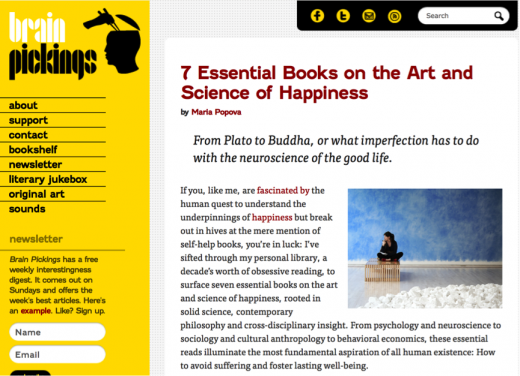 Brain Pickings is the brain child of Maria Popova, an interestingness hunter-gatherer and curious mind at large, who has also written for Wired UK, The New York Times, Harvard’s Nieman Journalism Lab, and The Atlantic, among others, and is an MIT Futures of Entertainment Fellow. Founded in 2006 as a humble email digest and eventually brought online, the site was included in the Library of Congress permanent web archive in 2012. Here’s a little bit about the 7 most important learnings from the journey so far. It’s our ability to tap into the mental pool of resources — ideas, insights, knowledge, inspiration — that we’ve accumulated over the years just by being present and alive and awake to the world, and to combine them in extraordinary new ways. In order for us to truly create and contribute to culture, we have to be able to connect countless dots, to cross-pollinate ideas from a wealth of disciplines, to combine and recombine these ideas and build new ideas — like LEGOs. The more of these building blocks we have, and the more diverse their shapes and colors, the more interesting our creations will be. Brain Pickings — which remains ad-free and supported by readers — is a cross-disciplinary LEGO treasure chest, full of pieces spanning art, design, science, technology, philosophy, history, politics, psychology, sociology, ecology, anthropology, and more; pieces that enrich your mental pool of resources and empower combinatorial ideas that are stronger, smarter, richer, deeper and more impactful.